According to the World Health Organization, more than 300 million people across the world suffer from depression. It’s a common mental disorder that is defined by persistent sadness, feelings of worthlessness or hopelessness, decreased energy, sleeping problems, thoughts of suicide and other symptoms. Depression can be crippling, as it can negatively impact your quality of life if not treated properly or left untreated. Therapy and antidepressant medications are common treatment options for dealing with the effects of depression. In addition to these methods, diet often gets overlooked as a way to manage symptoms of depression. 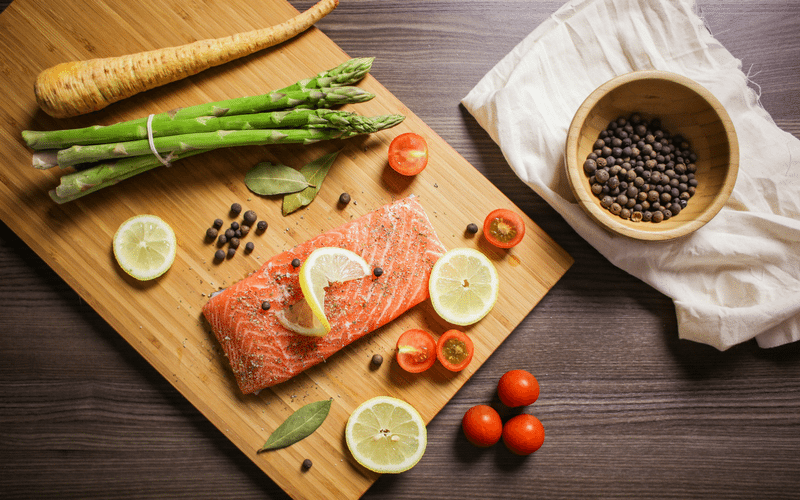 Treatment options may vary from individual to individual, but taking steps to improve your diet may reduce some common effects that depression has. There are multiple nutrients and vitamins that are pivotal to good mental health, and many of us may not get the proper intake of foods that contain the nutrients we need. Brussel Sprouts – Brussel Sprouts may have been your childhood boogeyman of the kitchen, but it’s time to face your fear. Brussel Sprouts are high in fiber and folate, both of which are extremely good for you. Folate plays a strong role in the brain’s production of neurotransmitters, and a high folate intake prevents mood disorders and dementia. Salmon – Salmon is high in omega-3 fatty acids. Low levels of omega-3 fatty acids can lead to mood swings, depression and poor cognitive and behavioral function. Cod, tuna, anchovies and sardines are other good sources of omega-3’s. Chickpeas – Chickpeas are high in vitamin B6, which has been linked to improving depressive symptoms. Chickpeas are an extremely versatile food that can be mixed in with nearly anything. Black Beans – Here comes that nutrient again. Black beans are high in magnesium and, you guessed it, folate! Beans are also rich in selenium, which has been linked to poor moods in diets with low levels of selenium. Lean Meats – Lean types of beef, turkey and skinless chicken are also rich in selenium, with lean beef also containing very high levels of iron and zinc, which are proven to decrease depression symptoms. Nuts – Various nuts, like cashews and brazil nuts, have been linked to lower levels of depression. Brazil nuts, like beans and poultry, also have very high levels of selenium. It’s best to consume only or two a day because of how high their selenium content is. Clams and Oysters – Clams are high in vitamin B12, which has been linked to a reduction in depression in men. Oysters have an incredibly high zinc content, which can reduce depressive symptoms as well. Broccoli – If you’re deficient in iron, broccoli could be a helpful food. It has more iron than meat, and contains chromium, both of which can help manage depression symptoms. Spinach – Spinach is considered a super food for a reason: It’s loaded with nutrients that can aid when suffering from a variety of conditions. It contains vitamins A, B12, K, folate, fiber and a ton of other nutrients that can be beneficial to your brain and mental health. Diet may not be a be-all end-all solution to your depression symptoms, but changing yours to take in the proper vitamins and nutrients can be a significant step toward managing your symptoms. Combining treatment options from a mental health professional with healthy dietary choices could lead to a healthier, happier you.